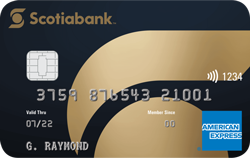 For a limited time only, get a $100 egift card to Amazon, Cineplex, or Indigo when you apply for the Scotiabank Gold American Express Card through Ratehub.ca and are approved. The #1 Travel Credit Card ranked by MoneySense and Ratehub.ca. Earn 4x Scotia Rewards points for every $1 you spend at eligible gas stations, grocery stores, on dining and entertainment. Access to airport lounges, special offers, merchandise, rewards and more.